Several years ago this patriotic scarf/banner was found in an antique store. We have never found quite the right spot for it but for this Fourth of July, it shall remain on the grandfather clock. Previously we had it here about a year ago. I think I like it on the clock. Not for always but for the Memorial Day through July 4th holidays it is perfect. Greets you when you walk in the door. Have a wonderful weekend and don't forget to join me for Sunny Simple Sundays. That's beautiful, Elaine! And both look better for the pairing. I like it. Very patriotic. The clock is the perfect place for it! I love that scarf draped on your grandfather clock, BIG TIME! I love the banner!!!! Love it. Thanks for nice compliment too....in high school, I was a springboard diver. My coach used to tease me and say the same thing! Hi Elaine! Oh, I love the scarf and it looks nice in both places! Hope you're doing well. I think it is great right there. 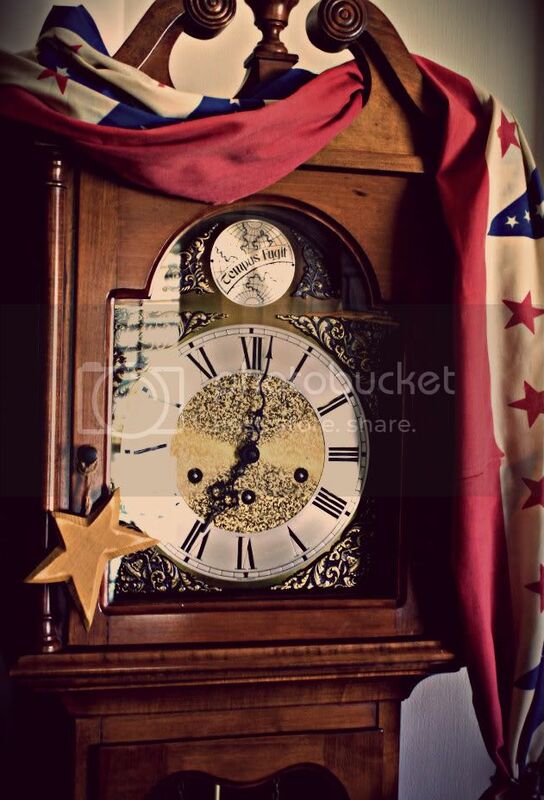 Your grandfather clock is so pretty...love the patriotic banner. That's a great place for it...on the clock!